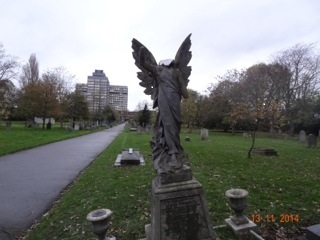 You may have noticed that earlier in 2015, some of our angels were missing but have now been restored. They spent time in the stone mason’s workshop being repaired, following the incidents where someone damaged statues in the borough’s parks and cemeteries November 2014. We keep a sharp look out for anyone acting suspiciously, and for those who overlook the cemetery, this is especially true at night when the gates are closed.